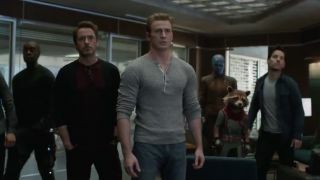 New Avengers: Endgame trailer - Tony Stark's back on earth, and wait, is that a Thanos face off? Marvel has thrown us yet another Avengers: Endgame trailer, only just avoiding April Fools’ day, presumably to tell us that the whole thing is utterly, completely serious. You’re going to be swamped with feels when you watch it as not only does it show Rocket and Nebula holding hands (sob), but also Tony Stark holding a photo of him and Peter Parker and oh dear god I’m crying. You can watch it below, and your main takeaway should be that this isn’t a triumphant trailer. The whole tone is sombre, serious, as if the Avengers know that after they take this leap things are going to change forever. Right, so, what big things does the trailer reveal about Avengers: Endgame? Tony Stark is back on Earth hugging Pepper, so he obviously survived being stuck on that ship… though I don’t think that comes as a surprise to anyone. Secondly, not everyone is on that ship at 37 seconds in: Ant-Man, Ironman, Nebula, and Ronin are missing. Are they dead? Out on another mission while Captain Marvel and co fly somewhere else to go and get their plan moving? Who knows (answer: the Russo brothers). Plus Ironman, Captain America, and possibly Thor (or Doctor Strange, depending on who’s behind that red cape) are back on Titan and walking up to Thanos, who’s sitting on the ground in front of a rather impressive two-handed sword. Maybe this happens in a different timeline, or Tony and his buddies have somehow stumbled across Thanos before their encounter with him that ended in such a big failure. Dammit Quill, why did you have to mess it up?! Some people on Reddit have spotted that it looks like Thanos has teleported from the ship in one scene, which suggests either that his Gauntlet isn't working anymore, or that someone else is using it. Also Ronin has gone all edgy with his tattoo sleeve, and Black Widow’s hair is all over the place too, possibly hinting at a big time jump happening in the middle of the movie. In the initial scenes it’s red with blonde edges, but in the middle when the whole team are on the ship it’s blonde, like in Avengers: Infinity War. Either she’s grown it out over time, or her hair is an indicator that there’s two realities: our group of Avengers living in the Thanos-snap world could desperately be trying to rewrite time by learning some lessons from what went on in the parallel universe. Maybe. Nothing is too far-fetched for Marvel, after all. If you want more Marvel goodness here’s who died in Avengers: Infinity War, or look below to see the Marvel universe without special effects!